The zebrafish model is rapidly gaining prominence in the study of development, hematopoiesis, and disease. The zebrafish provides distinct advantages over other vertebrate models during early embryonic development by producing transparent, externally fertilized embryos. Embryonic zebrafish are easily visualized and manipulated through microinjection, chemical treatment, and mutagenesis. These procedures have contributed to large-scale chemical, suppressor, and genetic screens to identify hematopoietic gene mutations. Genomic conservation and local synteny between the human and zebrafish genomes make genome-scale and epigenetic analysis of these mutations (by microarray, chromatin immunoprecipitation sequencing, and RNA sequencing procedures) powerful methods for translational research and medical discovery. In addition, large-scale screening techniques have resulted in the identification of several small molecules capable of rescuing hematopoietic defects and inhibiting disease. Here, we discuss the contributions of the zebrafish model to the understanding of hematopoiesis, hematopoietic stem cell development, and disease-related discovery. We also highlight the recent discovery of small molecules with clinical promise, such as dimethyl prostaglandin E2, 3F8, and thiazole-carboxamide 10A. Among vertebrate models, the zebrafish provides a unique combination of advantages for the study of developmental biology, genetics, and genomics, and has proven to be a versatile model for studying disease (Table 1). With blood circulation beginning in externally fertilized, transparent embryos within 23-26 hours of fertilization, the zebrafish has been particularly useful in the analysis of hematopoietic development . In addition, the zebrafish reproduces rapidly - a single pair can produce hundreds of embryos per week and mass mating strategies can produce tens of thousands of synchronized offspring. This unique combination provides the scale, visualization, and manipulation capabilities required for novel genome-wide studies of hematopoiesis and blood diseases in a vertebrate model. To this end, mutagenesis and suppressor screens have been used to find interesting phenotypes associated with defective hematopoiesis [2, 3]. Chemical genetics studies have investigated a variety of pathways, and large-scale chemical screens have identified many small molecules displaying clinical promise [4–6]. The zebrafish provides a comparable genome to other vertebrate species and has been used in studies analyzing gene expression and epigenetics [7, 8]. Furthermore, the use of morpholino oligonucleotides to examine gene knockdowns in a whole vertebrate has allowed the zebrafish to be more widely used . As a result of these characteristics, the zebrafish has become an important animal model and has provided new insights into biological systems. hpf, hours post-fertilization; HSC, hematopoietic stem cell. Here, we highlight the advantages of the zebrafish model through discussion of promising findings in the hematopoietic field with an emphasis on disease definition and management. In particular, we evaluate mutagenesis, gene knockdown, and screening in the zebrafish. These techniques have led to the discovery of several molecules and gene targets with therapeutic potential, including Tif1gamma, dimethyl prostaglandin E2 (dmPGE2), 3F8, and thiazole-carboxamide 10A. Furthermore, we highlight recent advances in the understanding of blood diseases, such as T-cell acute lymphoblastic leukemia (T-ALL) and hypochromic anemia. The zebrafish shows genetic similarity to other vertebrates. At approximately 1.8 billion base pairs, the zebrafish genome is about two-thirds the size of the human genome . Although the fish genome is vastly rearranged, several areas of local synteny and some larger chromosomal regions are preserved . This has greatly facilitated positional cloning projects, as chromosomal synteny can be used as a guide within the genome. Comparisons of chromosomal arrangements and individual DNA sequences in the zebrafish have revealed general conservation, particularly for the Hox loci . However, the zebrafish genome incurred a significant duplication that arose in teleosts about 300 million years ago. Because of the early incidence of this duplication in teleost evolution, the zebrafish genome has since undergone further alterations as subsequent deletions are believed to have removed many of the originally duplicated genes . These genomic events are demonstrated by the presence of seven Hox clusters in zebrafish compared with only four in humans . These alterations have provided unique opportunities for discovery, as they have sometimes led to a splitting of regulatory elements. For instance, the zebrafish has two independent transferrin receptor-1 genes . One is a general, ubiquitously expressed gene and the other is a red-blood-cell-specific gene. In humans, there is a single gene for transferrin receptor-1 that is expressed both highly in red blood cells and ubiquitously at a low level. Nevertheless, an independent zebrafish mutant in transferrin receptor-1 has been isolated that lacks red blood cells. Comparative genomic analysis and study of the regulatory sequences in this mutant may prove useful. Recent technological advances have also made zebrafish epigenetic analysis possible, as demonstrated by the use of chromatin immunoprecipitation sequencing (ChIP-seq) by a number of laboratories studying specific chromatin or transcription factor binding in whole zebrafish embryos [14, 15]. Furthermore, chromatin remodeling has been evaluated by analyzing specific histone modifications, such as methylation and acetylation. Recent studies have highlighted the specific post-translational modifications H3K4me3, H3K9ac, and H4ac as activating; H3K27me3 and H3K9me3 as repressing; and H3K36me3 as being involved in transcriptional elongation [16, 17]. Through these techniques, the zebrafish model has helped to clarify the relationship between epigenetics and gene function, and can be expected to further contribute to this understanding in the future. The zebrafish model has been pioneered as a genetic system for studying a variety of different diseases, including hematopoietic disorders. In 1996, new mutagenesis protocols allowed the derivation of many novel blood mutants [18, 19]. Male zebrafish were soaked in ethylnitrosourea (ENU), introducing mutations to the sperm or spermatogonia. The males were then mated with females, creating progeny that carried over 100 mutations per genome. Outcrossing these mutants formed F2 families, which were subsequently crossed to analyze the autosomal recessive or dominant hematopoietic mutations in the F3 generation. The initial experiment derived more than 50 independent blood mutants that formed 26 complementation groups when cross-mated [18, 19]. Most of the mutated genes have since been isolated and linked to many defects in mesoderm induction, stem, or progenitor cell formation, and erythroid or T-cell development . Analysis of several red blood cell mutants isolated novel genes that correlated to mutations found in several human subjects with anemia. At least three independent zebrafish mutations, and the resulting blood disorders, have contributed to the discovery of the molecular basis of human diseases (Table 2) [21–23]. GSK3, glycogen synthase kinase 3; HSC, hematopoietic stem cell; PLK1, polo-like kinase 1. *Three hematopoietic mutations originally identified in zebrafish have since been linked to human genetic mutation and disease (see text for details). †Known function in zebrafish. ‡Known function in humans. Other large-scale approaches have been applied to the zebrafish system. One uses 'targeting-induced local lesions in genomes' (TILLING), a process by which random mutagenesis and individual exon sequencing are carried out to identify mutations within a particular gene, essentially mimicking the outcome of targeted mutagenesis . This approach has led to the derivation of mutants in the runx1 and gata1 genes, which encode transcription factors specific to the blood program [25, 26]. Furthermore, an insertional mutagenesis screen was conducted by Nancy Hopkins and co-workers, in which a retrovirus was inserted into the genome to promote random mutagenesis [27, 28]. The recovered mutations defined 315 independent mutants affecting early development. In another study, retroviral insertions were shown to be highly efficient on a genome-wide scale, with nearly one in five integrations resulting in mutation . The mutants discovered in these large-scale screens have proved extremely useful, with some associated with cancer phenotypes and others affecting individual organs. In the zebrafish system, haploid genetics can also be used [30–32]. This is extremely powerful as it reduces the extensive requirements typically associated with genetic screens. In a haploid screen, males are mutagenized (with ENU) and mated with a female. The eggs produced by the second-generation females are studied by in vitro fertilization with UV-irradiated sperm. The UV irradiation functionally inactivates the paternal DNA while maintaining sperm fertility, thus creating haploid animals. Zebrafish haploids typically survive for 4 days, but the reason for death is unclear. However, given that blood formation occurs within the first 36 hours of development, haploid screens can be used to study independent hematopoietic mutants. A recent variant of such a screen used early pressure to identify several mutants that affected T-cell development [20, 33]. The early pressure method suppresses the second meiotic division, generates gynogenetic diploids, and thus eliminates the additional complexity created by heterozygosity . Using this particular method, the sart3 gene was found to be critically required for thymus development through regulation of the U6 small nuclear ribonucleoprotein . Morpholinos are small antisense oligonucleotides that are constructed to specifically target sequences at the transcriptional start site (ATG morpholinos) or at intron-exon splice junctions (splicing morpholinos) and allow selective inhibition of a target gene . The use of morpholinos has greatly expanded the versatility and importance of the zebrafish model in biomedical sciences [9, 36, 37]. Morpholinos have been used extensively for the knockdown of a variety of hematopoietic genes and have proven to be an important tool for genetic screens. For instance, we are currently conducting a chromatin factor screen, targeting over 480 independent factors via morpholino knockdown, to determine DNA rearrangement requirements in hematopoiesis. This screen provides a means for determining the role of chromatin factors in the birth of hematopoietic stem cells (HSCs) in the aorta and in globin expression (HT Huang, K Kathrein, and LI Zon, unpublished). Recently, we undertook a novel genetic suppressor screen in the search for recessive mutants that rescue a zebrafish mutant phenotype (Figure 1) . This screen focused on the mutant moonshine, which completely lacks blood due to a defect in the chromatin factor Tif1gamma . Tif1gamma contains several motifs, including a PHD finger-bromodomain and a ring finger domain, and several laboratories have demonstrated its involvement in transforming growth factor beta (TGF-beta) signaling [39, 40]. The aforementioned screen  sought another gene that, when mutated, would restore blood development in moonshine. To this end, moonshine was rescued with a transgenic bacterial artificial chromosome (BAC) containing the wild-type copy of tif1gamma. 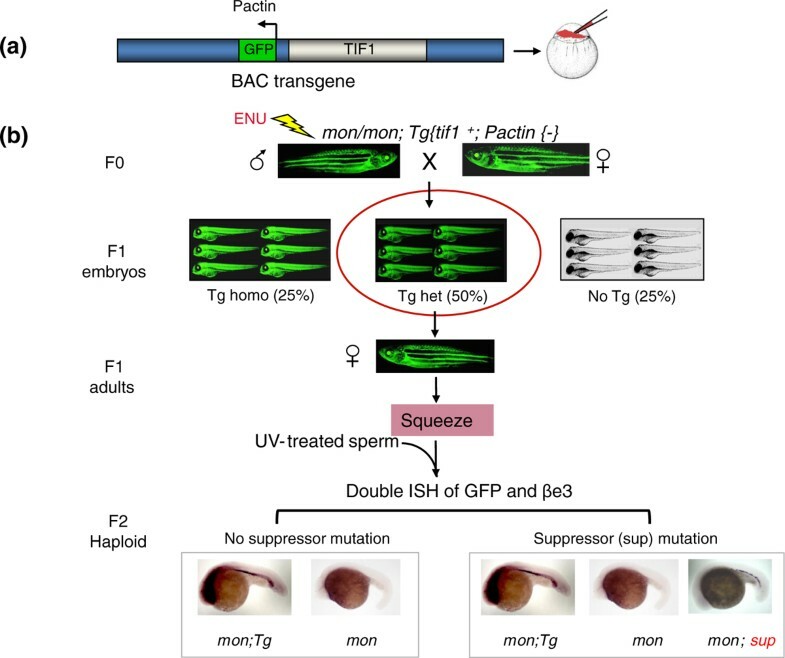 The BAC had a ubiquitous actin promoter driving green fluorescent protein (GFP) expression, resulting in stable transgenic fish that were both green and homozygous mutant at the endogenous tif1gamma locus. These fish were mutagenized and a haploid screen was conducted. Half of the screened embryos were GFP positive and half displayed the moonshine phenotype. A suppressor was defined as a recessive mutation resulting in the rescue of blood in at least half of the mutant phenotypes. Using this zebrafish screening model, we discovered two independent suppressors (sunshine and eos) . We mapped the sunrise suppressor to cdc73, a gene involved in the polymerase-associated factor (PAF) complex, which is required for transcription elongation. The PAF complex includes several other factors, which, when inactivated in the moonshine background, also resulted in rescue. This demonstrated involvement of the PAF complex in hematopoietic cell transcriptional elongation. Purification of the complex bound to Tif1gamma demonstrated the transcriptional involvement of other cell-specific regulators, including Gata1 and the basic helix-loop-helix transcription factor Scl, and the elongation factor P-Tefb, which is the kinase responsible for phosphorylation of RNA polymerase II and its regulator DRB sensitivity-inducing factor (DSIF) . This suggests a model whereby all blood gene transcription in moonshine is paused until the additional mutation in the PAF or DSIF complex promotes rescue by obstructing transcriptional inhibition. This novel mechanism has also been observed in other cell types, including in melanocyte cell fate regulation . Genetic suppressor screens in zebrafish reveal additional mutations capable of rescue. (a) The bacterial artificial chromosome (BAC) transgenic construct containing a wild-type Tif1gamma locus and green fluorescent protein (GFP) driven by an actin promoter (Pactin) used in our recent genetic suppressor screen . The transgene was injected into one-cell-stage embryos (right) to rescue the lethality of Tif1gamma mutant (mon) fish. (b) Schematic diagram of the suppressor screen. Stable transgenic fish are homozygous mutants for the endogenous tif1gamma locus (mon/mon) but retain viability because they are heterozygous for the transgene. The GFP marker on the transgene makes them green fluorescent. F0 males were mutagenized with ethylnitrosourea (ENU). In the F1 generation, 25% of progeny were transgene homozygotes (Tg homo, mon/mon; Tg/Tg, bright green), 50% were transgene heterozygotes (Tg het, mon/mon; Tg/+, light green, in red circle), and 25% lacked the transgene (No Tg, mon/mon, gray). Only the progeny that were heterozygous for the transgene were raised to adults. The F1 females were then squeezed to provide unfertilized eggs that were activated by UV-treated sperm. The UV treatment destroys the paternal DNA while still allowing fertilization. The resulting F2 embryos were haploid and were subjected to in situ hybridization (ISH) at 22 hours post-fertilization for GFP and beta e3 globin probes. Transgenic embryos (mon;Tg) were positive for both probes, whereas non-transgenic embryos (mon) were negative for both probes. However, embryos that were negative for GFP but positive for globin indicated the presence of a genomic suppressor (sup) mutation. Modified, with permission, from . In another suppressor screen we analyzed the cdx4 mutant kgg, which is defective in HSC development because of abnormal hox gene expression [42, 43]. Several chemicals were found to rescue the cdx4 mutant, many of which are involved in the retinoic acid pathway. This suggests that the Cdx-Hox pathway mediates the retinoic acid response during hematopoietic cell development. Through these types of large-scale screens, the zebrafish model provides a means of defining connections between abnormal gene function and their respective pathways. Zebrafish embryos have become a very useful tool for studying developmental responses to chemical treatment . We recently conducted a chemical screen investigating the birth of HSCs in the aorta. In this screen, individual embryos were placed into a 96-well plate and chemically treated (Figure 2) . 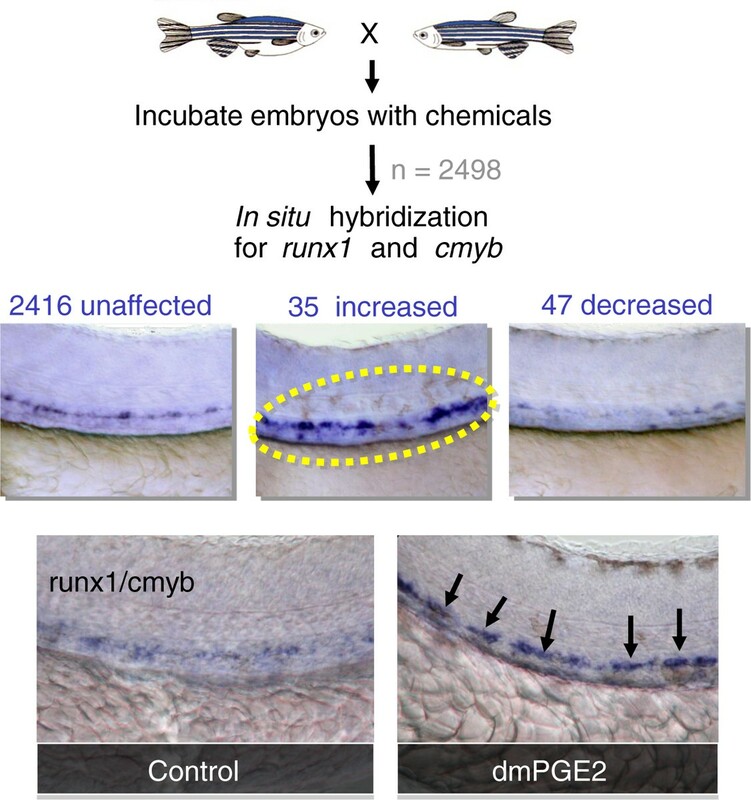 Embryos were then stained for the stem cell markers Runx1 and c-Myb. The screen revealed 35 chemicals capable of enhancing HSC engraftment, the most potent of which was dmPGE2, a known small lipid mediator of inflammation that is upregulated during marrow transplantation. Following its discovery in zebrafish, we tested the efficacy of dmPGE2 in mammals using a limited-dilution competitive repopulation assay in mouse marrow transplants, which showed a fourfold increase in HSC engraftment. This increase is sufficient for therapeutic consideration. For instance, current cord blood transplantation uses a single cord for young children, whereas adult transplantation requires two cords. dmPGE2 increases cord blood engraftment in non-obese diabetic severe combined immunodeficiency (NOD/SCID) animals and has been shown to be non-toxic in primate competitive transplant models . Large-scale vertebrate chemical screening made possible by zebrafish. Embryos are incubated in groups of 5-10 with approximately 2,500 different chemicals. At 36 hours post-fertilization, in situ hybridization is conducted to analyze the expression of early hematopoietic markers such as runx1 and c-myb. The embryos are then scored for a change in hematopoietic expression. We recently used this technique  to identify 82 compounds that influence hematopoietic stem cell differentiation, the most prominent of which was dimethyl prostaglandin E2 (dmPGE2). Modified with permission, from . Many other small-molecule screens have been performed, contributing equally promising candidate chemical treatments. The discovery of 3F8, a novel inhibitor of glycogen synthase kinase 3 (Gsk3), has great potential as a candidate for therapeutic use. Gsk3 is a key member of the Wnt and hedgehog signaling pathways and has been linked to a number of human diseases, including type 2 diabetes, bipolar disorder, Alzheimer's disease, and some cancers . The combination of multiple pathway involvement and multiple disease implication makes Gsk3 a potentially important drug target. In a recent chemical screen of 4,000 compounds, 3F8 was found to phenocopy the 'no-eyes' embryonic zebrafish phenotype observed in cases of Wnt overexpression, as the result of Gsk3 inhibition . Subsequent analysis has shown 3F8 to be more selective and potent than the previously used GSK3 inhibitors, suggesting increased potential for research and clinical application . These studies demonstrate the advantages provided by the zebrafish model as a platform for conducting large-scale screens for potential molecules that target stem cell development, hematopoietic differentiation, and disease-related mechanisms. Small-molecule screens have proven invaluable to the discovery and evaluation of chemicals displaying potential for clinical research and as reagents for translational research. Zebrafish hematopoietic development occurs in two waves, an embryonic and a definitive wave, and seems to be highly conserved in mammals (Figure 3) [49, 50]. The zebrafish embryonic wave initiates at the 1-3 somite stage when hemangioblasts develop. This process is comparable to mammalian primitive hematopoiesis, which takes place in the yolk sac mesodermal cells . The cells arising from these tissues are the early progenitors of endothelial and hematopoietic cells. The further differentiation of these tissues occurs early in development (about 15 hours post-fertilization (hpf)) in zebrafish and about 19 days post-fertilization (dpf) in humans) . In zebrafish, this differentiation is characterized by two stripes of lateral mesoderm that converge toward the midline before fusing to form the blood island . The blood island serves as the functional equivalent of the mammalian yolk sac and is the developmental site of primitive erythrocytes and some myeloid components . At 36 hpf, HSCs are formed in the ventral wall of the dorsal aorta in a similar manner to that seen in other vertebrates, a process that occurs at day 27 in human development . This HSC formation, in the aorta gonad mesonephros (AGM) region of each organism, marks the beginning of the definitive wave of hematopoiesis, with the majority of these cells functioning as progenitors and a few others acquiring self-renewal ability. The zebrafish definitive wave continues in the caudal hematopoietic tissue (CHT; about 3 dpf) before seeding the kidney (about 4 dpf), whereas in humans the definitive wave continues in the fetal liver and placenta (about 35 dpf) before seeding the spleen, thymus, and bone marrow [53, 54]. The ability to study primitive and definitive hematopoiesis in an externally fertilized, and thus more accessible, vertebrate species has facilitated the dissection of several signaling pathways regulating hematopoiesis. Hematopoiesis in zebrafish and humans, and known zebrafish blood mutants. The stages of hematopoiesis are illustrated, with the genes and mutants identified as affecting each stage shown (red, zebrafish blood mutants; blue, genes altered by the mutations) and the processes in bold below. Bottom: the sites and times of the events shown in human and zebrafish. AGM, aorta gonad mesonephros; CHT, caudal hematopoietic tissue; dpf, days post-fertilization; hpf, hours post-fertilization; HSC, hematopoietic stem cell. 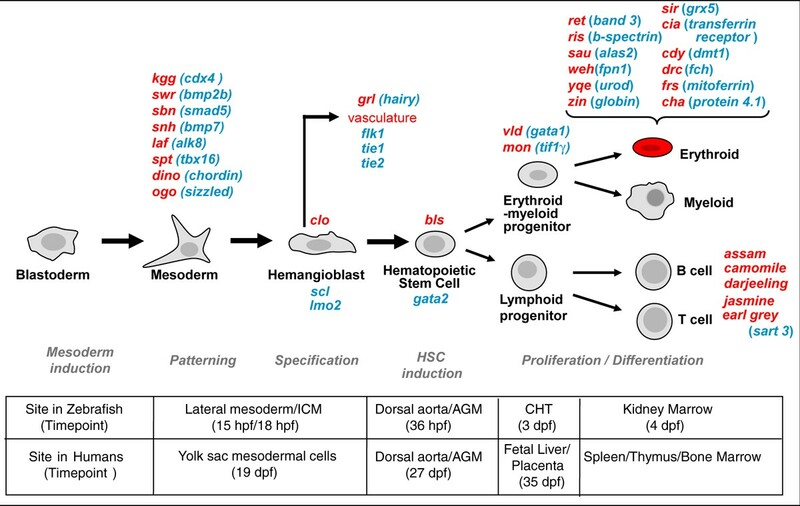 The ontogeny of HSCs has been a major focus of research in the blood research community. Use of the cd41-GFP zebrafish transgenic line has shown that HSCs are first derived in the AGM region and are marked by CD41 positivity [55, 56]. Further analysis using the cd41-GFP line has led to the observation that CD41-positive cells exist in two distinct populations, which are manifested as GFP(hi) or GFP(lo) cells in this system . After sorting by flow cytometry, each CD41 population was evaluated for long-term engraftment and multilineage reconstitution in sublethally irradiated zebrafish. The resulting data indicate that cd41-GFP(lo) cells represent true HSCs, as these cells are capable of both engraftment and long-term sustainment of the hematopoietic program . The origin of HSCs has long been an important topic in the hematopoietic field. However, recent advances in zebrafish live imaging technology have provided new insights into HSC emergence from the AGM region. Transgenic zebrafish with red-labeled endothelial cells and green-labeled blood cells have been used to directly visualize the budding process of HSCs from aorta endothelial cells [57–59]. Using the kdr-GFP transgenic zebrafish line, which drives GFP expression under the control of the kdrl gene promoter in vasculature starting at 18 hpf , time-lapse fluorescence confocal microscopy revealed endothelial cells emerging from the aortic floor and entering the sub-aortic space starting at 30 hpf, a process that has been termed endothelial hematopoietic transition (EHT) . The emergent kdr-GFP+ cells are morphologically consistent with hematopoietic progenitor cells and are shown to seed the CHT (35 hpf) and thymus (3 dpf). runx1 morpholino knockdown in the kdr-GFP line has also demonstrated that the EHT event is a Runx1-dependent process, as the budding process does not occur in the absence of Runx1 [58, 59]. Visualization of HSCs in adult zebrafish had been difficult until the recent development of an adult transplant zebrafish model called Casper . The Casper line lacks pigmentation, which allows individual cell visualization in transplants of fluorescent marrow. This provides an adult fate mapping and imaging model that can be used to analyze kidney colonization and development. One of the greatest attributes of the zebrafish model is the ability to trace hematopoietic cell fate as differentiation occurs in the embryo. Caged fluorescein dye, which changes color in response to a laser pulse, can be injected into embryos [61–63]. Laser activation of single cells, or groups of cells, allows the tracking of individual cell derivation over time. This technique has been particularly useful in the study of HSC development within the aorta. 'Uncaged' HSCs were followed as they colonized the CHT. The cells arising from the CHT then seeded the thymus and the kidney . In zebrafish, the kidney serves as the primary site of larval and adult hematopoiesis . Analysis of fluorescently labeled, mutant, or morphant (morpholino knockdown) cells has enabled the investigation of cell migration and development. This has led to the discovery of chemokine receptors that are responsible for thymus colonization in the zebrafish . In addition, fate mapping can now make use of transgenic zebrafish containing a Cre-Ert2 (mutated estrogen receptor) construct that, when initiated, switches the expression of an integrated construct from the green label GFP to the red label DsRed in specific cells or tissues . The progeny of these switched cells maintain DsRed expression and are easily traced through development. These studies have enabled visualization of the hematopoietic system at significant resolution and have been extremely useful for defining the sites of zebrafish hematopoiesis. In the zebrafish, blastula transplantation provides a model for examining cell autonomy in many cell types, including HSCs . Mutant or morphant cells are injected with a fluorescent dye and then transplanted into a wild-type embryo or vice versa . The implanted cells are tracked using their fluorescence. Transplantation of a fluorescent mutant cell that results in the lack of fluorescent blood indicates that the gene acted in a cell-autonomous manner. More recently, this technique has been improved to allow transplantation of blastula cells from a myb-GFP donor. This transgenic line contains a BAC expressing GFP under the control of a myb promoter, which marks donor cells as they form HSCs in the dorsal aorta . These cells are then injected into a recipient containing a red fluorescent protein (RFP) construct that labels the vasculature red. The derivation of green cells adjacent to the red endothelial cells indicates autonomous effects of stem cell production. These techniques allow the tracking of individual cells, which is very informative in the study of such a dynamic system. The zebrafish model has been used in the discovery of many new compounds with potential for clinical and therapeutic applications (Table 2), including several zebrafish cancer models that have been introduced over the past few years. These models are generally easy to manipulate and study while showing high genetic similarity to human cancer lines . One such model uses a conditional Cre/lox-regulated system under the control of a heat shock promoter that drives rag2 expression in developing T cells [70, 71]. Several recent publications have investigated this system in the study of T-ALL and cancer biology. A recent T-ALL study found that high levels of the apoptosis regulator Bcl2, the G-coupled protein receptor S1p1, and the cell adhesion protein Icam1 blocked tumor cell intravasation, an important initial step in metastasis . In addition, results obtained using the zebrafish model have allowed the differences between human T-cell lymphoblastic lymphoma (T-LBL) and human T-ALL to be defined according to their cellular and molecular components. Currently, human T-LBL and T-ALL are treated with the same regimens; however, these data have demonstrated key molecular differences that could allow more targeted treatments in the future . The characterization of the ferroportin gene by zebrafish gene cloning is a prime example of the relevance of the zebrafish model for the discovery of disease-related genes . Ferroportin was mutated in the weissherbst mutant and, using this model, was found to be the iron transporter responsible for delivering maternally derived iron from the yolk to the embryo. Human placental cells have since been found to express ferroportin . Thus, maternal iron delivery to the fetus by ferroportin has been evolutionarily conserved for 300 million years. Furthermore, anemia of chronic disease has been linked to this gene through the ligand hepcidin, which binds ferroportin and promotes its internalization. Dysregulation of this pathway can lead to hemochromatosis, an iron imbalance disorder . Ferroportin mutations have been found in several patients with hemochromatosis, and this illustrates how studies of a zebrafish mutant have contributed to the definition of a human disease. More recently, mitoferrin and glutaredoxin 5 have also been linked to iron defects. Since its discovery as an enhancer of HSC development in zebrafish, dmPGE2 is advancing towards clinical use. A clinical trial is currently analyzing dmPGE2 and its potential for enhancing engraftment in cord stem cell transplants. In that trial, leukemia or lymphoma patients are recruited and treated with high-dose chemotherapy before being transplanted with two independent cord blood samples. One of the cords is pretreated with dmPGE2, and following transplantation the level of chimerism is evaluated to determine which is the dominant cord. Thus, the trial will investigate whether dmPGE2-stimulated cells might display better engraftment capability over time, a result that could greatly increase the efficacy of cord blood and bone marrow transplantation in humans. Through mass mating procedures, the zebrafish can be used in various high-throughput genomic techniques that have not been possible with other vertebrate models. The advantages provided by the zebrafish in visualization, fate mapping, and early embryonic development contribute greatly to cell biological studies, particularly as they pertain to early hematopoietic development and HSCs. In addition, mutagenesis, chemical, and other large-scale screens are important methods for the discovery of novel pathways and potential therapeutics targeting hematopoiesis. As mentioned, transplantation assays have also been developed in the zebrafish [75, 76]. The first marrow transplants were performed using GFP-positive whole kidney marrow transplanted into irradiated adults. GFP-positive blood cells can be seen in the host up to 6 months after transplantation. Serial transplantation has also demonstrated effectiveness, as recipients retain GFP-positive blood for months after transplant. More recently, competitive repopulation studies between red and green fluorescently tagged marrow cells have been performed in the Casper line, in which marrow cells are pretreated with a chemical and evaluated for competitive advantage . Through the use of this technology, chemicals can be screened to assess their ability to enhance transplantation, and thus to enhance the robustness of HSC development, engraftment, and retention. Recent advances in epigenetic and sequencing technologies, particularly the development of ChIP-seq and RNA-seq, have allowed the investigation of molecular interactions on a genome-wide scale . Recently, the genome-wide binding sites of the essential hematopoietic transcription factors Gata1, Gata2, Runx1, Fli1, and Scl in human megakaryocytes were identified . Analysis revealed 144 regions representing 151 candidate genes that showed simultaneous binding of all five factors. Of these genes, 18 had known functions in hematopoiesis, and the zebrafish model was then used to further investigate these genes. Eight genes were chosen at random and targeted for knockdown using morpholinos. In each case, morpholino injection caused a significant reduction in erythrocyte, thrombocyte, and/or HSC number. This study demonstrates the effectiveness of the zebrafish model in validating results found in other organisms using a high-throughput in vivo system . The use of ChIP-seq analysis has also led to resolution of the molecular interplay among external signaling transcription factors and cell-specific regulators during hematopoietic regeneration. In a recent study using a combination of zebrafish, murine, and human inputs, the BMP and Wnt signaling pathways were shown to be essential for hematopoietic regeneration following acute hematopoietic injury . In this study, ChIP-seq analysis demonstrated that Smad1 and Tcf7l2 co-occupy sites with cell-specific master regulators in a dynamic manner throughout differentiation. These data suggest that the hematopoietic program is coordinated by a finely tuned collaboration between master regulators and external signaling factors, in which master regulators direct the binding profiles of the signaling transcription factors. In addition to serving as an effective chemical screening platform, the zebrafish model has shown promise as an efficient means of prescreening small molecules for drug candidacy. A recent study evaluated the specificity of three molecules that are known to inhibit polo-like kinase 1 (Plk1) in vitro, a protein that is overexpressed in many tumors and thus is considered a potentially important target for cancer therapy . Analysis of Plk1 has revealed high conservation between the zebrafish and human homologs, including a nearly identical active site composition . The study investigated the Plk1 inhibitors LFM-A13, ON01910, and thiazole-carboxamide 10A to determine which molecule provided the most specific and effective inhibition in vivo. The embryonic phenotypes resulting from each chemical treatment were compared with the phenotype resulting from direct morpholino knockdown of Plk1. The results indicated that whereas each inhibitor showed promise in vitro, only one, thiazole-carboxamide 10A, selectively inhibited Plk1 in vivo. This result highlights the difficulty associated with the discovery of drug candidates through in vitro methods, as well as the significant advantage provided by using the zebrafish model to prescreen potential therapeutics in vivo . The zebrafish model provides a tremendous balance between scale and applicability. The ease of mutagenesis, high fecundity, and visualization techniques, in conjunction with the largely conserved hematopoietic system that the zebrafish provides, allow large-scale genomic analysis while maintaining relevance in higher organisms. The definition of genes involved in T-ALL and hypochromic anemia, and the discovery and assessment of dmPGE2, thiazole-carboxamide 10A, and 3F8 have demonstrated the relevance of the zebrafish model for clinical and therapeutic research. This model will continue to help define genetic and epigenetic mechanisms in blood cells using the high-throughput procedures ChIP-seq, RNA-seq, and morpholino screening. Further studies of HSC development, self-renewal, and differentiation using the zebrafish model have great potential to contribute to advances in the treatment and management of numerous blood diseases and cancers. We would like to thank Erin Langdon and Alison Taylor for help in the editing process, and Dorothy Giarla for organizational and submission assistance. LIZ is a founder and stockholder of Fate, Inc., and a scientific advisor for Stemgent.